“In consideration of the context, the design aimed to reinterpret the traditional beach shack vernacular in a contemporary way by embracing traditional materials, including corrugated metal, fiber cement sheeting, and timber elements,” Rathmayr says. The architects’ inventive use of resources helped keep costs down. “We gave the facade’s ribbed metal cladding, commonly used in neighboring beach shacks, a metallic finish that provided a cost-effective solution and an upscale appearance,” Rathmayr says. All openings are shade-protected with wide overhangs that prevent overheating and allow maximum light to enter into the living space. Natural ventilation, created by openings in the facade, negates the need for air conditioning. The firm developed a custom joiner for the powder-coated aluminum window frames, providing floor-to-ceiling views without the use of costly commercial window systems. An open-plan kitchen, living, and dining area runs along one side of the upper floor. A study is situated next to the kitchen, while the other half of the building houses the two bedrooms. Black matte bamboo flooring by Silestone and birch ceilings, finished in a walnut stain, add warmth and texture to the interior. In the kitchen, a Blanco exhaust fan is surrounded by a stove, oven, and dishwasher by Westinghouse. A series of pendants by She Lights are equipped with LED fittings. The top floor opens onto an expansive deck on the north side of the house. An entry yard on its east side provides a seamless connection to the outdoor environment, while ensuring adequate shading and screening for privacy. The largest portion of the living area is supported by cross-braced columns. Flanged steel beams create a strong, lightweight frame. 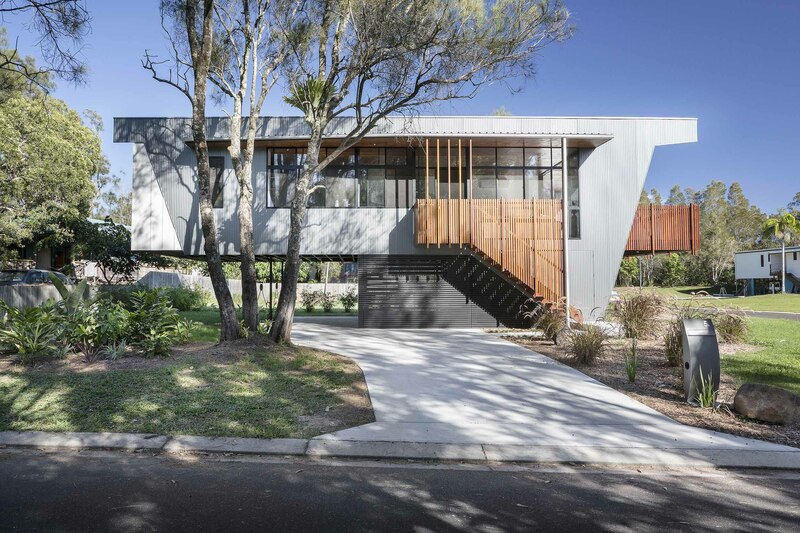 The vertical ridges and muted color of the home’s corrugated metal cladding contrasts with wood balustrades that line the stairs and balcony. Located in Byron Bay, Australia, the Northern Rivers Beach House is chock-full of ingenious solutions to a difficult brief. Challenged to re-interpret the traditional beach shack on a limited budget, architects Erhard Rathmayr and Monika Obrist of Brisbane firm refresh*design developed the building around flood restrictions that prohibit all habitable floors from being less than six and a half feet above ground. The law led them to create a cantilevered living space raised on a plinth, where both ends overhang and counterbalance one another. Made of steel, the soaring bridge-like structure contains an open-plan kitchen, dining, and living area on one side, with bedrooms and bathrooms on the other. Storage, parking, and laundry is housed down below. Sustainable materials like bamboo, plywood, and plantation timber add warmth to the living areas, while each room’s cross-ventilation system, facilitated by openings in the home’s facade, take advantage of the cool sea breeze.